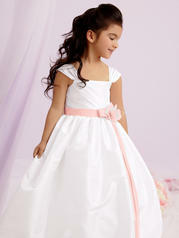 Shown in White and Light Pink�Floor length Iridescent Taffeta dress with pleated detail on bodice and shirred straps. Satin band , bow and flower at waist. Available in ankle and floor lengths.